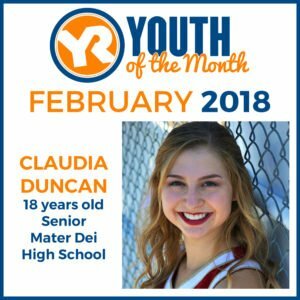 One week at a time—that’s how Mater Dei High School senior and February’s Youth of the Month, Claudia Duncan, manages the many sports events, club meetings and service commitments on her calendar. “You just see her at everything,” said Mater Dei School Counselor Shea Reneer. She’s also a 10-year member of 4-H and was named “Miss Congeniality” at the 2017 Vanderburgh County Fair. Claudia does it all while maintaining a 4.0 GPA. “If a big project is coming up or there’s something I need to prepare for, I make sure to break it into small tasks to make it easier on myself. If I know I have a busy day after school, I’ll finish my homework the day before. I practice a lot of time management skills,” Duncan said. 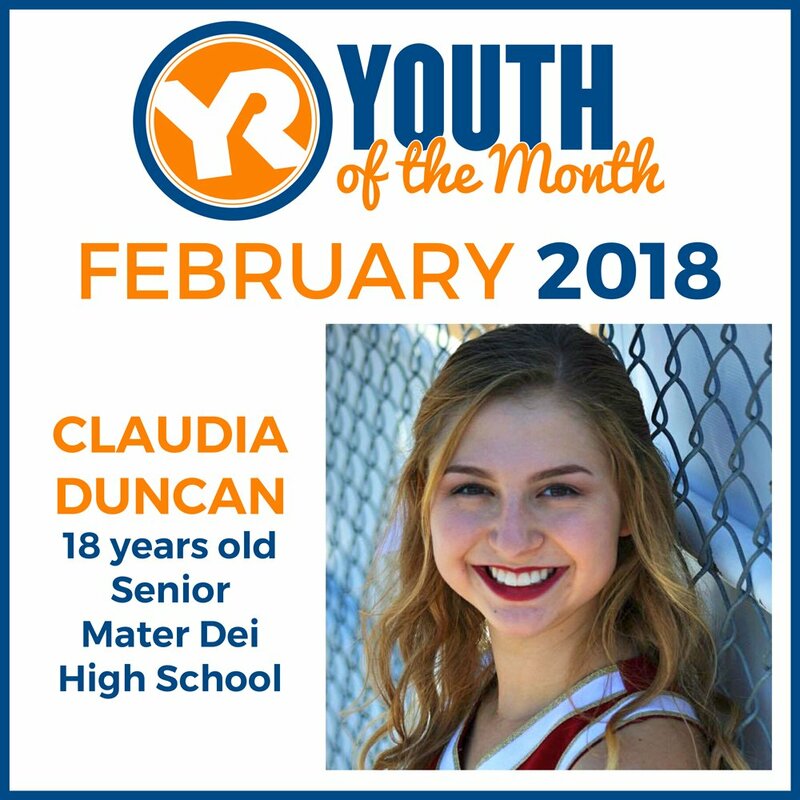 Though she spends many hours supporting her school (even serving as the mascot at pep rallies), Claudia also values the impact she can make beyond Mater Dei through Youth Resources’ programs. She enjoys participating in TEENPOWER, Teen Advisory Council and Vanderburgh County Teen Court. Claudia was nominated for Youth of the Month honors by her grandmother, Diane Angermeier, who says she’s impressed by the way her granddaughter handles herself. “She’s very, very self-assured. Nothing ever kept her from investigating, learning, trying,” Angermeier said. Mater Dei President Dr. Timothy Dickel witnessed that self-assurance last fall. After a Tomorrow’s Work Force luncheon, he watched Claudia walk up to keynote speaker and former governor of Indiana (now president of Purdue University) Mitch Daniels and introduce herself. That initiative paid off. Daniels gave Claudia his business card, and the two have since exchanged emails. Though she hasn’t decided yet which college she’ll attend, Claudia plans to study actuarial science. As February’s Youth of the Month, Claudia is now a finalist for Youth Resources’ Youth of the Year award, presented annually at YR’s Hall of Fame Celebration. To nominate a student (ages 5-18) for Youth of the Month, click here. Erin Meyer is the Development Director at Youth Resources and a YR alumna.